To celebrate the relaunch of the Butterfly Crafts blog with a lovely new design and layout, and to celebrate being in business for four years now (where did that time go) I am having a giveaway of some lovely handmade products. It has been a long and challenging four years where I have learned on the job about running a handmade creative business. There have been ups and downs, new websites, multiple craft fairs and meeting some fabulous people along my journey. It is for this reason I would like to say a big thank you to both my followers and loyal customers - old and new - with a giveaway selection pack of crafty makes from Butterfly Crafts. 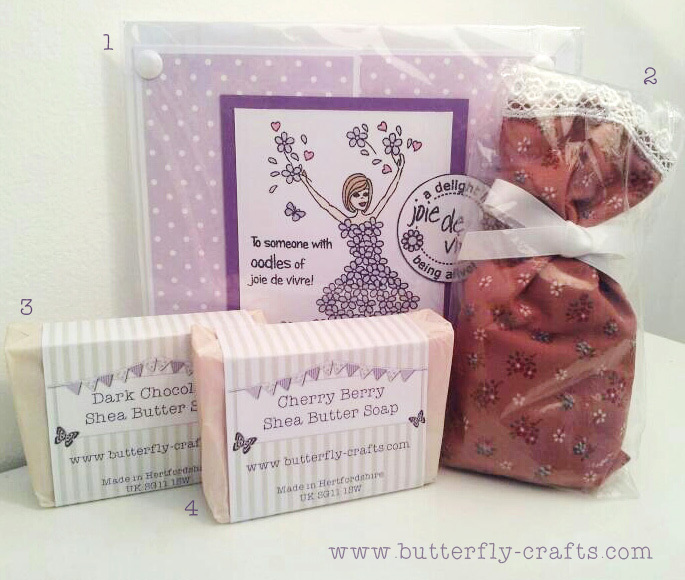 In the Giveaway pack you will receive a handmade Joie de Vivre Greetings Card (1), Sweet Citrus and Bay Scented Sachet (2), Dark Chocolate Shea Butter Soap Bar (3) and Cherry Berry Shea Butter Soap Bar (4). 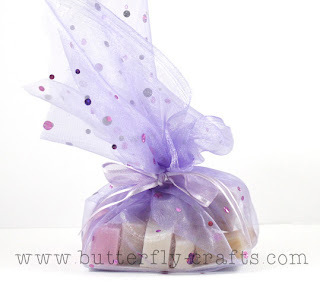 There will be a runner up prize of a handmade natural soap taster bag. T&Cs – This giveaway is open to UK and international followers and will close on Friday 26 April at 5pm GMT. The winner and runner up will be announced on the blog shortly after. A big thank you to everyone for their support over the past four years, I wish you luck with my giveaway! I love handmade because you can feel the love that went into creating each piece. The individualism is also nice - to look around a world where a lot of people have the same thing and know that yours is different. Nimrodita couldn't have said it better. I feel the same way. It is so satisfying to know that you have something that is special and was made with great love and care. That can't be said about products that are mass produces. It's even more special when someone compliments something and I get to tell them the story of it. Handmade is supporting an artist's work, not a CEO's vacation home. Hand made supports an artist's work, not a CEO's vacation home. I love handmade because it is always something special and unique - even if there are several copies available, they will never be exactly the same. Also handmade is usually more unique and thoughtful of a gift. No two are exactly the same. I love handmade because it's more unique and personal. I prefer to support small businesses instead of large corporations that don't care about their products, customers, or employees. Handmade products show the care and dedication of their makers and each is unique. No two are ever the same. I love handmade........everything! I have always made things since I can remember. I believe in supporting us folks that take pride in everything we make. Big corporations really don't care what we think and how we want to use our products. I love handmade because it is made by someone who cares about the item and is passionate about what they do. They also want to share that with other people. I would rather support that than a company that doesn't care about their products or their staff. I love thinking about the person making a craft that they love. Items with fragrances are even better because they are the gift that keeps on giving! I also love to use handmade items in my BAM sets that I sell in my shop and am always looking for new companies to try out. Kerry Ann Vollmer: I love homemade because of all the LOVE put into it, generally the homemaker loves what they do and it doesn't come with a Made in China sticker on it :-) Seriously there is absolutely nothing on earth that says more than a homemade product. I love handmade too because handmade is the kind of creativity. I appreciate your work.